Who We Are: Inspired by our Catholic faith, we have opened a residence that provides shelter and support to pregnant women and new mothers who have no other place to go. Who We Serve: Our Lady of Guadalupe Home will serve new mothers who are in crisis but have no place to live due to unfortunate circumstances or lack of support from loved ones (family members and/or baby’s father). We welcome all women of any race or religion. What We Do: Our Lady of Guadalupe Home will provide shelter, support and counsel to new mothers in crisis for up to a year. Our Present Financial Situation: Our Lady of Guadalupe Non-Profit Home is a registered charity, dependent on Divine Providence to meet our needs: food, household upkeep and most importantly, salaries. We are unique in that we have paid staff on duty 24 hours a day, 365 days a year. Our Lord has provided for us far beyond anything we dared to imagine. In answer to prayer a very generous donor came forward and built a large house for our program. Let us thank God and pray for the donor of our house, and for many others who have been so generous in providing everything we have needed so far. We depend on the providence of God to continue providing for our daily needs. Please join us in praying for wisdom and the means to do this work, and in thanking God for inspiring generous people to make it all happen in the real world. Thy will be done: nothing more; nothing less! That describes Carolyn: a very humble person. Not weak, but humble: she knew what needed to be done, and she went about doing it quietly, thoroughly and faithfully. Her family seemed genuinely surprised to learn of the extensiveness of her involvement and how well she’s known (and loved) in all of the Right to Life branches all over Ontario. Even Windsor Essex Right to Life Association initially expressed surprise when it was suggested that she be the recipient of the 2013 Byrne Award. After they thought about it for a moment, they agreed, well, yes, of course! Why didn’t we think of her? Carolyn was involved extensively in the Church, especially in the Catholic Women’s League, and in the Right to Life Movement, participating in all of its branches: Nationally (Campaign for Life Coalition, Ottawa March for Life; Canadian Centre for Bioethical Reform to name a few) and Locally (Annual Walk for Life; Mothers’ Day Walk, Life Chain etc.). 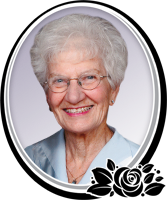 A team player, she was part of the group that brought 40 Days for Life to the Windsor area, and she was co-foundress of Our Lady of Guadalupe Home for Mothers and Babies here in Windsor. She was tireless in her involvement and participation: writing letters to Politicians and Periodicals, participating in every vigil and activity, attending presentations and conferences and travelling widely to participate in prayerful demonstrations, witnessing for the sacredness of Human Life. Carolyn educated herself thoroughly on issues surrounding the value of human life. She read extensively, attended presentations and was always up to date on life issues. Having learned about the brutal methods employed in abortion, the sale of aborted baby parts, and the fact that 50 babies a week are killed in the Windsor/Essex region alone, she couldn’t stand it. She must do something, no, everything she possibly could to stop this shameful assault on innocent human life: the greatest tragedy of our time. She would give her life to defend the sacredness of human life. Being firmly convinced of the sacredness of human life, she defended it fearlessly but respectfully, no matter how aggressive her opponent. Lord God, I thank you today for the gift of my life, and for the lives of all my brothers and sisters. I know there is nothing that destroys more lives than abortion, yet I rejoice that You have conquered death by the Resurrection of Your Son. Today I commit myself never to be silent, never to be passive, never to be forgetful of the unborn. I commit myself to be active in the Pro-Life Movement, and never to stop defending life until all my brothers and sisters are protected, and our country once again becomes one which respects life from conception to natural death – not just for some, but for all, through Christ our Lord. Amen! To me, the candle is a perfect image of her life. As a candle is lit by fire, so her passion was ignited by the Love of God, which she received daily through intense prayer, especially Eucharistic Adoration, scripture reading, and the reception of the Eucharist, which is Life itself. And, as a candle is used up in fulfilling its purpose to provide light, even in the darkest of places, so she was “used up” in the fulfillment of her vocation to defend the sacredness of human life. she gave her very life so that others might live. Thank you, Carolyn for inspiring us to witness for Life as you did. May God reward you!